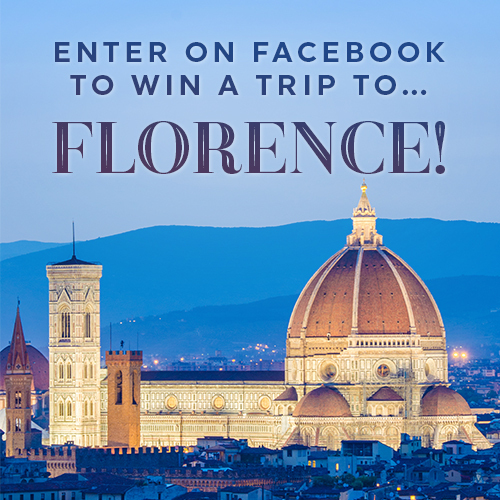 If you’re a U.S. resident, enter our the Perillo Tours Facebook Sweepstakes for the chance to win a spectacular 4-night getaway to the city of art! Airfare for two from a U.S. gateway to Florence. Four nights at the Grand Hotel Minerva. Day trip to the Tuscan countryside with a private driver. Private wine tasting and lunch at Tenuta Torciano. I love it! Can’t wait to go! It would bring a dream to life. Amazing booked a trip with you in 2015 South & Southern Sicily and it was the best – want to be a steady travel companion with you especially to Italy and part as well ! I would love to tour Italy and get to visit my relatives who live in a small town in the Abruzzo region of Italy. I would love to visit Italy and see where both sets of grandparents lived before coming to the U.S.
We are retired and have never been to Italy. I have relatives in Sora, Italy. Can hardly wait to see this beautiful country!! it would truly be a trip of a lifetime. I have always wished to go but have not had the means to make it a reality.. Visiting the land of my late grandparents would be very enjoyable…it’s time! I was there for two weeks.It was not enough.My wish is to return. I have been to Italy twice as a teenager and it is on my list of places to go with my mom. She was born in Italy. I would wheel her all over Florence and it would be my gift to her for being such a wonderful mom.